It's not everyday that we have ICCA Quarterfinal champs on to host a College A Cappella live broadcast, but that's exactly what's happening tomorrow. That is because the Horned Tones of Texas Christian University will be our next featured group on our Facebook series "Aca Live." The all-male group from Fort Worth, Texas may not look like your typical vocal group with their custom baseball jerseys and athletic builds when they step foot on a stage, but as soon as their voices begin to harmonize, you know you're in for a treat. The group is looking to capitalize off of their impressive 2017 ICCA run which saw them take first place at their Southwest Quarterfinal. They're hoping to bring all of this momentum into the upcoming competition season. You're in for a fun-filled night as the group takes over our Facebook page tomorrow night to perform live. You can watch the stream beginning at 7:30 PM/CT. You can learn all about the group by reading our featured interview with them below. Our group was founded by Raymond Shideler four years ago. Up until that point, there had been no a cappella scene at TCU. The idea of The Horned Tones was that we can bring an asset to TCU’s campus, something that they had never seen before. A community of fun, goofy, talented gentlemen who, at the same time, are dedicated to improving their musical skills with the ambitions to one day be among the elite of the a cappella community. Year-by-year we’ve worked towards these goals. The TCU campus has continued to respond warmly to us, and our group goals become stronger from year-to-year. Our vision is to be at the top, while remembering that it’s important to maintain the community aspect and have a good time while getting there. 2. What makes the Horned Tones so special? What makes members join the group versus looking into other student organizations? We would argue that the environment of The Horned Tones is among one of the most unique around campus. We are composed of all kinds of individuals – from members who are on the football team, to members who are in ROTC, to students that hold positions in student government. We have actually been told at competitions that we don’t look like a typical a cappella group, and I think people like that about us. Our involvement around campus demonstrates how we can love our a cappella craft while remaining connected to the university. Not only that, but we take our singing and competing seriously, and it’s something we enjoy with some of our closest friends. 3. What are some of you all's favorite performances or moments from the past few years? Last year, we won the ICCA quarterfinals here in Fort Worth, Texas. This was a sign of our growth and progress as a group, and was really encouraging as it brought us closer together. 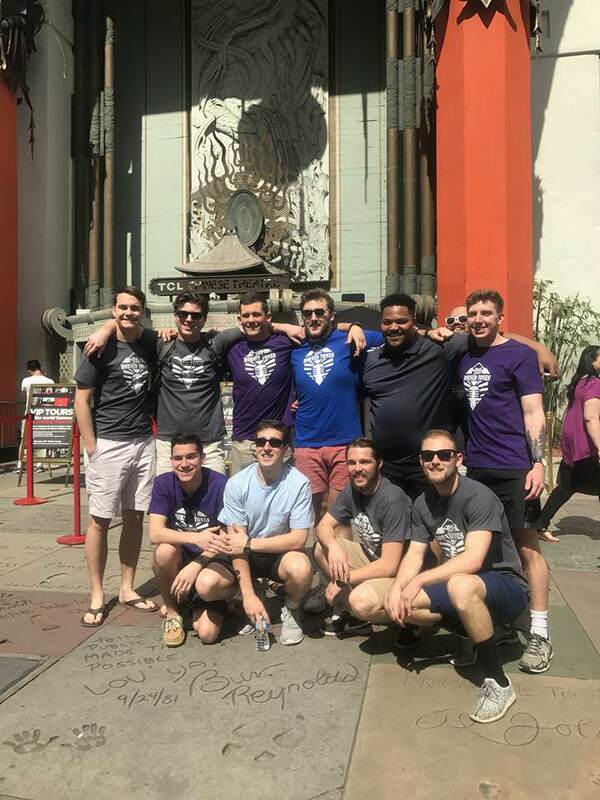 Getting to go to Los Angeles to compete in ICCA Semifinals last year was a great experience. We got to tour the city a little bit and even sang on the streets of Hollywood. We also had the opportunity to open for Jesse McCartney two years ago which was a pretty incredible experience. Last year, we sold out our spring concert, and we had a blast doing that as well. Aside from these things, we also love doing concerts or gigs around the TCU community as well as around Fort Worth and having the support from our peers and people in the communities around us. 4. What are some things that you all enjoy doing outside of music as a group? Almost all of us enjoy playing sports. At our first ICCA Quarterfinals in 2016, some of the other groups said we looked like a rugby team more than an acapella group because so many of the guys are tall and athletically built. Also, with the exception of a couple of new members this year, we're all majoring in things other than music ranging from nursing, to engineering, Pre-Med, Business, Athletic Training and beyond. So, it's a diverse group of guys but we all share in common a love of singing and having fun. 5. Is there a funny memory or awkward moment from a past trip or performance that stands out in your mind? Our pitch guy bought a brand-new pitch pipe for ICCA Semifinals last year and when we were warming up 30 minutes before singing, we realized it had gone out of tune on one of our starting notes so we had to quickly find someone else with a working pitch pipe. Then at our next concert at TCU he had to tell the whole crowd the story of how this happened as punishment. 6. Last season, The Horned Tones were crowned Southwest ICCA Quarterfinal Champions. What was that experience like? Was this your first ICCA competition? What did it mean to your group? This was our second year competing in ICCAs, and so we were much more prepared for what it was like than in 2016. It was an awesome moment when we were on stage after finishing our set and knowing we had crushed it. We went in there looking to win, and we did, but now we want to do even better so we hope to be able to advance even further this time. 7. Are there any big plans for the future? What do you all hope to accomplish within the next year? This spring we're hoping to record an EP to get some of our favorite songs out there for people to enjoy. We'll continue to do gigs around Fort Worth and on campus. Last year, we collaborated with the women's acapella group, Here Comes Treble, on our spring concert and we may do that again. 8. Your Chick-Fil-A cover video has garnered thousands of views on social media since being uploaded last year? Where did the idea come from and did Chick-Fil-A really let you all film in one of their eateries? We have a Chick-Fil-A as the only fast food chain on our campus, so we all love it. That's a fun song we found and like to sing (along with other songs about food) every once in a while. Part of the video was in the restaurant on campus and the employees there are wonderful and are always friendly to the students getting food. So, they were happy to play along and sing with us while we were filming. 9. What has been the most rewarding part about being in a college a cappella group? Likewise, what has been the most challenging aspect? Winning quarterfinals last year was an awesome moment. All the work we'd put in felt worth it in that moment when they called our name. The challenge has been finding time to put in work. Since everyone has different majors and schedules and we have members in ROTC and on the football team, it's hard to find time to rehearse. Mostly we practice after 9:00 on weeknights so it can be pretty draining at times when we have homework we still have to do. 10. What are the Top 3 albums/artists the group is currently streaming? We like all kinds of music so I guess I'll say our favorites have to be the guys in our group who have produced music: Raymond Shideler (look up Raymond Revel on Spotify or YouTube) and Nathan Griffin (and his band The Shortlist on Spotify, etc.). I guess a third would be we all got into Jon Bellion a bit last spring. We love singing and having a great time. Our goal every concert is to sound good and to have fun so that everyone in the audience has fun with us. We also try very hard to adopt the personality and emotion of each song we sing and to vary the songs to have different meanings throughout a set. We want to leave people laughing at some songs and crying at others because they're experiencing the emotions of the song. 12. Lastly, could you give us some background info on the below video from your Instagram? That video is a clip of us singing "Brother" by NeedToBreathe last Fall for a benefit concert put together by a TCU choir student. He invited us and lots of groups of students from all music backgrounds to perform and raise money to send to victims of Hurricane Harvey in Houston. Brother is an important song to our group. It was our closer last year at competition and embodies how we all feel about each other - we're all part of the group because we love singing but also because we love the individuals in the group. It's a tight-knit group where we all know we can be supported by everyone there, so that song is something we can really put our hearts into.